While there have been many a writing attempted in this genre, Anita Sivakumaran’s cleverly crafted anthology still emerges as a thirst quencher in a parched land. While there have been many a writing attempted in this genre, Anita Sivakumaran’s cleverly crafted anthology still emerges as a thirst quencher in a parched land. Beginning with the first narrative, it manages to hold the reader in sway by imparting a (fresh) no-holds-barred angle. It maintains a bold stance, giving reign to the ‘free-thinking’, where the twist in the tale does not fritter away the original mould. Seemingly small details such as topographic elements—be it Sita’s forest abode, Kannagi’s bustling market town or Narada or Shiva’s shivering mountain abode—strengthen the narrative. In ‘Lakshmanan’s Circle’, Sitai, the protagonist, shares space with Surpanakai. However, while Surpanakai is still the uncouth, unsightly demon-woman, it is Sitai who captures the reader’s imagination. While not strictly a rebel, she does come across as someone with a mind of her own, who (without too much speculation) doesn’t consider matrimony a be-all-and-end-all of a woman’s existence. No bond is a bond, if the heart isn’t in it. Very slowly, she ‘sheds’ the bond and how! All the stories are not about the female protagonist alone. In this mythological retelling, some of the narratives are driven by male protagonist as is the case with the ‘The Terrible Oath’ and ‘Nandi’s Pain’. But then again it’s impossible to do away with the strong female presence! Towards the end, the strange reconciliation in Bhishma’s case and Nandi’s courting partner will reiterate the fact as to who is the ultimate hero. The author attempts an ‘It’s a boy’ in ‘Krishnalila’ that is told from the perspective of women in Krishna’s life, while of course, it touches on Krishna and Arjuna. But thereafter the narrative is about Draupadi, the epitome of fire—warm and fiery; Devaki and Kamsa; Yashoda and Putana from his childhood memory and the eternal and the endearing gopis. It is also here that Krishna avers that “Radha never lay exclusive claim to me” and “Kunti is the wily one”. Complete with ‘Akalya the Chaste’ and ‘Kannagi’s Anklets’, the first three chapters are a treat. Notably in the first three stories the retelling holds the original beautifully. Akalya is bold and clear-headed in her wanting to be with Indra, so much so that when her sage-husband coaxes her into thinking that she was tricked into adultery, she refuses to budge. It is in the same spirit of clarity she refuses to go with Indra if her position in heaven is with the apsaras and not as his consort. Kovalan’s muse in Kannagi’s plot is part of the ongoing plot and not a prelude. The fabric is still woven around Kannagi’s devotion to Kovalan and her willingness to go miles for him—pawn away every piece of her prized jewellery only so that he gets to occupy the pride of place in the king’s court. In the end the city of Madurai is destroyed by her fury, but the fire guiding the rage is where the author once again demonstrates her brilliant craft. 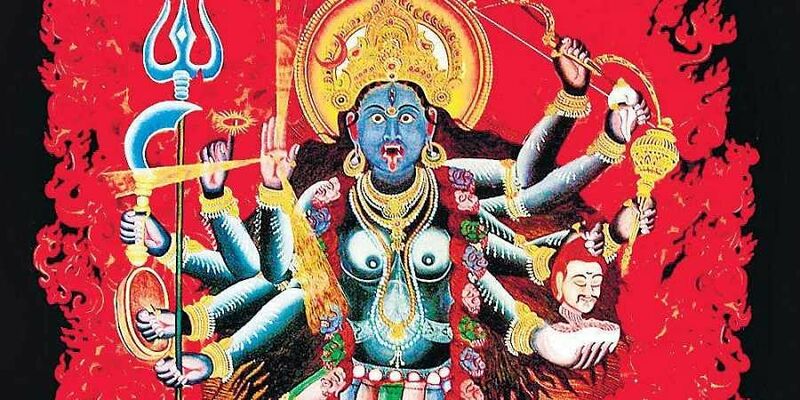 This is also visible in the title story, ‘The Birth of Kali’, where the end connects so many elements and deftly brings it all together like a stroke in the end. The message in ‘The Making of Avvai’ is what the crux of the book is—“As long as she is fed and watered,” said the old woman slyly, “she is free to think her thoughts and sing her songs”. Our legendary Avvai chooses to plant the seed in the young head, not through small talk but long walks in the field and around the village. The author has meandered into a landscape that is both rich and raging, and warm and stoid.